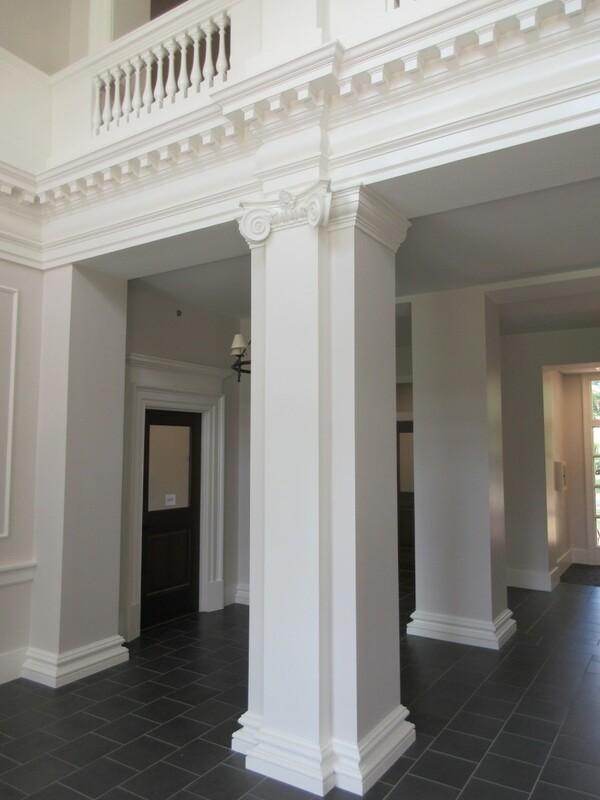 I recently was commissioned for the design development, manufacture and installation of a large entablature including capital, architrave, frieze and cornice with sculpted ornamental plaster elements as well as a large cove above an attic storey under the direction of local architectural firm Glavé & Holmes for Veritas, a Classical Christian Academy in Richmond, VA. The precedent images and designs provided by the architects were of the Classical Angular or "Scamozzi" Ionic as interpreted by British Palladianism with canonical references in the writings and schematic drawings of 18-century architect James Gibbs and the recently passed Robert Chitham. This project reveals much of the process of design, production and installation of fibrous moulding plaster; a tradition of plasterwork that, with a few contemporary adaptations, has remained remarkably consistent for the past couple of hundred years. 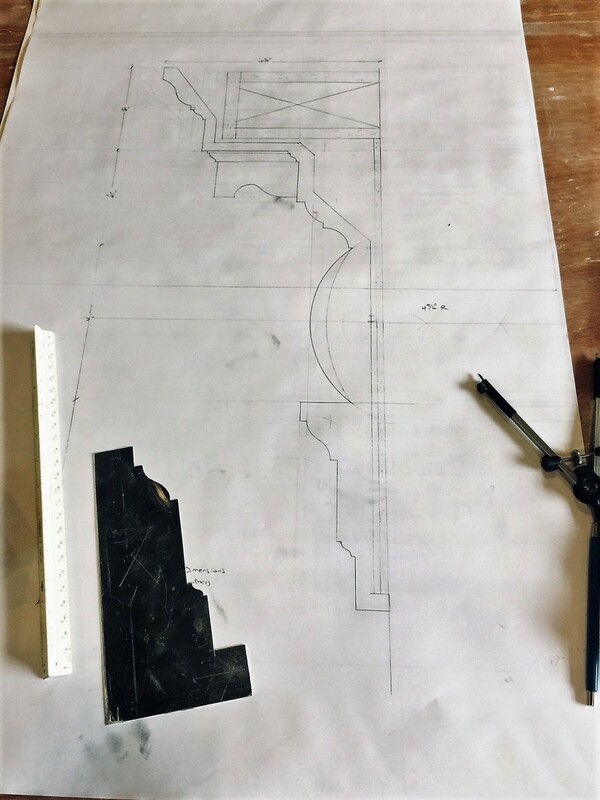 In fibrous, that is to say, pre-cast mouldings, you always begin with the drawing of a profile on a piece of paper. The architect already had a profile sheet for all of the elements; however, he was very open to adjustments. 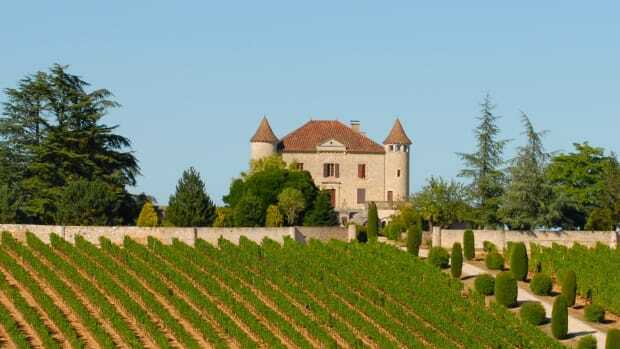 Some alternations are suggested for practical reasons. 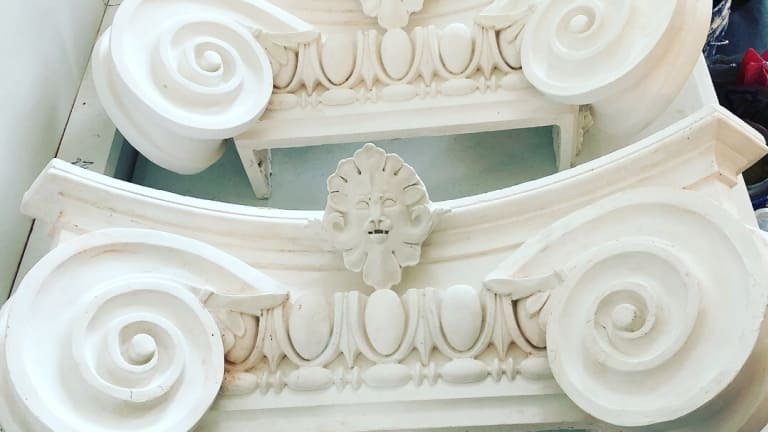 As most architects are more familiar with millwork details, plaster mouldings have their own requirements for thickness and blocking, that is to say, substrate support. 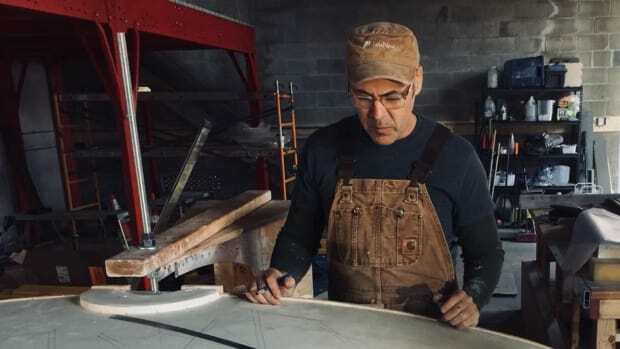 Often, as was the case here, the plasterer is called upon to detail how their mouldings would be supported and what the general contractor needed to do to prepare for that. Furthermore, in this instance, the architect really respected my experience and design judgement and invited me into the process of refining and adapting the design to the space. Together the architect and I decided to make some adjustments. We extended the projection of the large cove above further into the ceiling, changing the radial profile into that of an approximate ellipse and making the springing and crowning mouldings for the cove significantly more delicate giving the overall feeling of the cove a certain lightness. The canonical reference, that is to say, theoretical design from an architectural treatise for the entablature assumed an exterior elevation realised in stone. As our project was for a somewhat confined interior space, we decided that it made good sense to reduce the projection of the cornice. This turned out to be a good decision as the cornice can only be viewed from close range and this adjustment made the space feel more open. 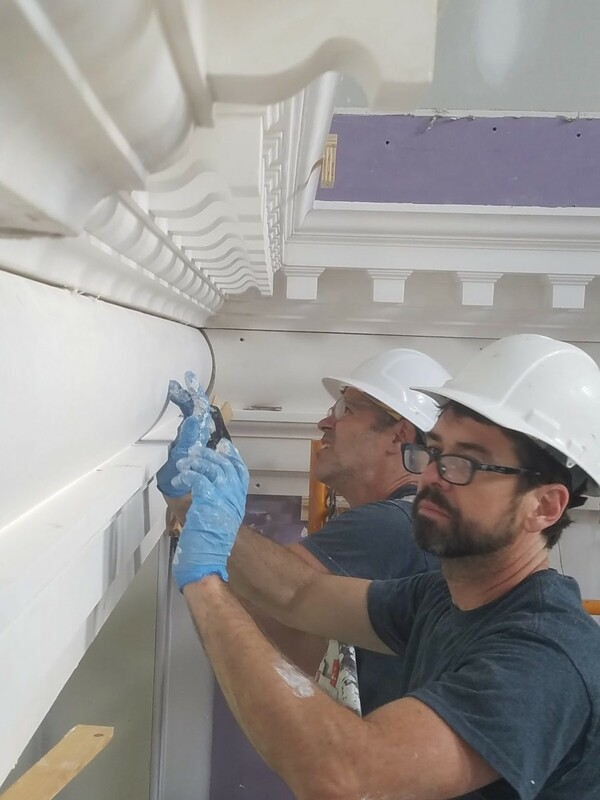 A final adjustment I would mention was our decision to "pulvinate," that is to say, give a convex radial profile to the frieze. This is a move that Palladio himself might have made and adds a charming playfulness to the design. From the drawn profile, knives are cut in sheet aluminium, mounted on running moulds and extruded in plaster upon a long bench. 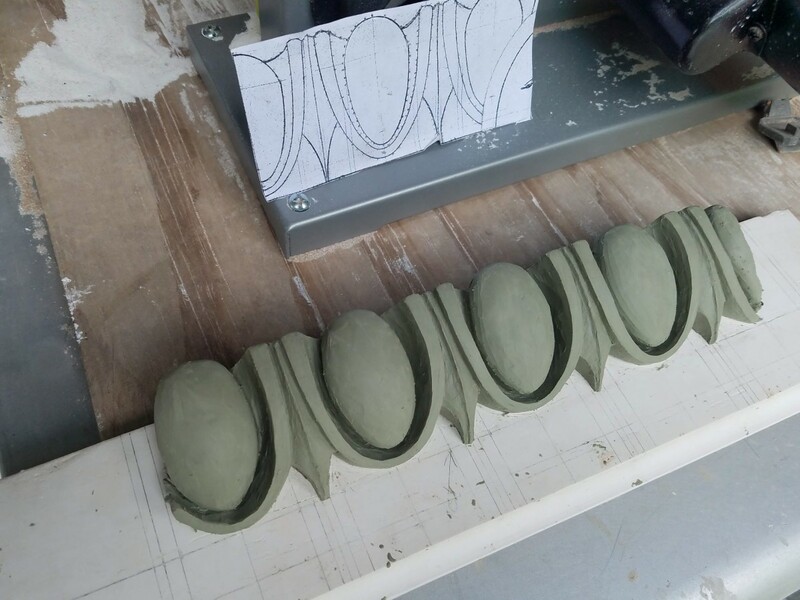 For this project we essentially made one master run moulding of each profile, cleaning it up perfectly and from these models produced moulds for casting in silicone or urethane rubber. For the entablature, we were able to join the architrave and frieze into a single mould and incorporate the modillion blocks into the cornice. This allowed the entire entablature to be produced in just two pieces. With the investment of rubber moulds in place, shop production was simply a matter of casting. Traditionally hessian cloth (hemp or jute burlap) is used to reinforce plaster mouldings and was, in fact, the method for a few of the profiles. However, for the large cove and entablature mouldings we utilised a more contemporary method of GFRG (glass fibre reinforced gypsum) where successive sheets of fibreglass veil are used in place of hessian. The result is a still strong but lightweight and more flexible moulding, ideal to reduce stress on the pieces and the substrate supporting them. From there, the cast pieces were stood up to dry, rotated as necessary to make sure they did not warp in the process. Then as dry goods, everything gets crated for delivery to the job site. We were pleased to discover that the architect did not want to simply order a stock capital from a supply company but wanted something elegant, refined and perfectly adapted to the space. With the specification of a bespoke Ionic pilaster capital, we were called upon to put on our artistic caps and undertake a bit of sculpture. The general layout of the most prominent feature, the spiral volutes, is determined by the application of a logarithmic "Goldman" spiral; however, this is just a two-dimensional form and the precise breath and spring of the fillets and the curvature of the canalis is more of a visual art than a mathematical science. Additionally, location and overall size of the volutes were determined by vertical alignment of the eye with the pilaster shaft and horizontal alignment with the bead and reel among other alignments and constraints. Other visually prominent architectural enrichments were the bead & reel and egg & dart. For these, we took a field trip to New York City to look at some fantastic precedent examples in stone and plaster. We found a wide variety of interpretations. The examples that resonated most with us had a clear contrast between the crisp, almost sharp elements with most delicate and sensuous of curves. Additionally, the architect expressed the desire of the eggs as being almost fully formed and as in high relief as possible. For the carving, we used a very firm oil modeling clay from which we were able to mould directly. Finally, the architect and I proposed to the headmaster using the fleuron of the capital to express something special about the purpose of Veritas as a Classical Christian academy. 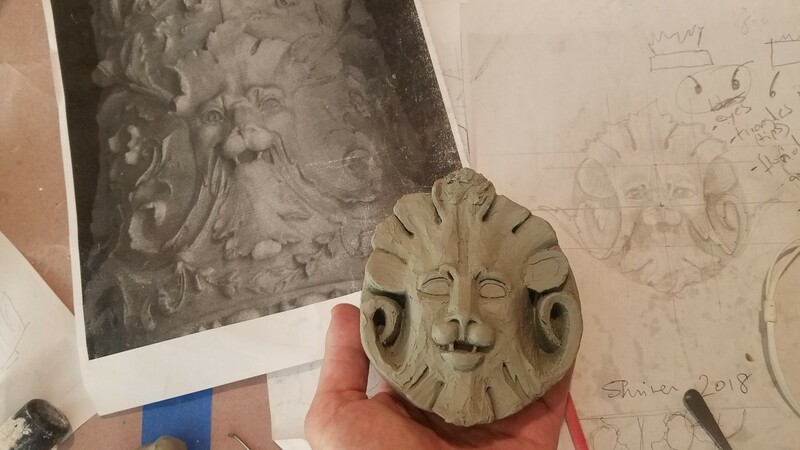 Rather than the typical bunch of acanthus leaves (that I always find awkward visually), we proposed the image of a "green" lion, that is to say, the face of a lion that undergoes a metamorphosis into vegetal form. In Christianity, the lion came to be associated with John the Baptist, “The voice of one crying in the wilderness, Prepare ye the way of the Lord, make his paths straight,” identifying the voice of truthful speech as a precondition for spiritual enlightenment. Likewise, in Christian iconography, the evangelist Mark himself came to be depicted as a winged lion who held the truthful word in his right paw. The most powerful use of the symbolic lion being that of Jesus Christ, "the Lion of the tribe of Judah", "the Word made flesh", the Logos that brought the world into existence through speech. So, the aforementioned served as inspiration for our design, to serve as a symbol, to point, to remind the young men and women who pass through those doors to embody the Logos in their own education, orienting themselves towards the good by becoming powerful, articulate speakers and actors of truth. Fibrous, pre-cast mouldings in gypsum plaster were uncommon before their accelerated development in 19th century France. Until then plain profile plaster mouldings were generally run-in-situ in with only the loose ornaments cast and affixed one by one if not actually modeled in place. However, for lightly framed, drywall covered substrates typical of contemporary construction fibrous mouldings can be an effective solution. Because the pieces are cast and dry upon arrival the installation resembles that of millwork, comprehensible to general contractors. The mouldings are first "dry fit" to ensure they are level, plumb and in proper alignment with other architectural elements of the room. The mouldings are then removed one by one, lightly soaked, "buttered" in the back with plaster and affixed permanently. Countersunk screws are used to pull the moulding into precise alignments and serve as a secondary, mechanical attachment until the plaster has fully set. Counter-intuitively, joints between the plaster pieces are left open by at least a 1/4". 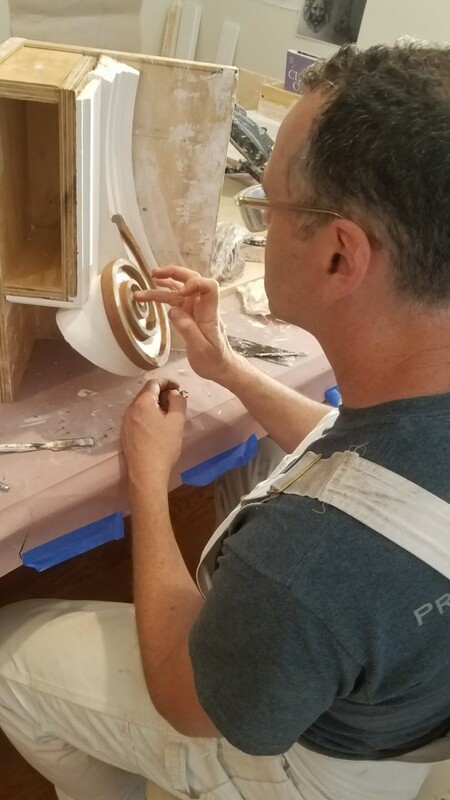 This allows the "pointing" or plaster filling the joints enough opportunity to overcome the strong suction of the plaster and fully set before drying. 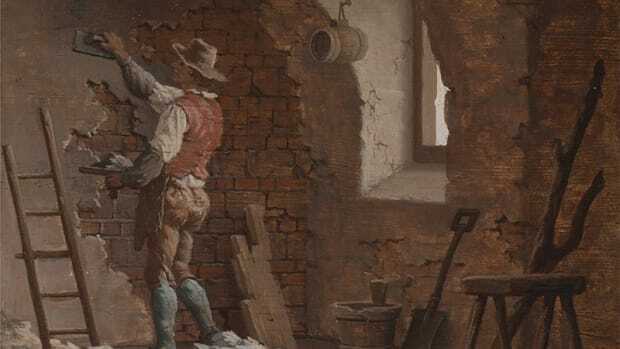 As the plaster mouldings are applied to a plaster substrate with plaster and plaster is used to fill the joints, the end result is a solid, monolithic moulding that becomes a part of the wall, intended to be appreciated for generations to come.